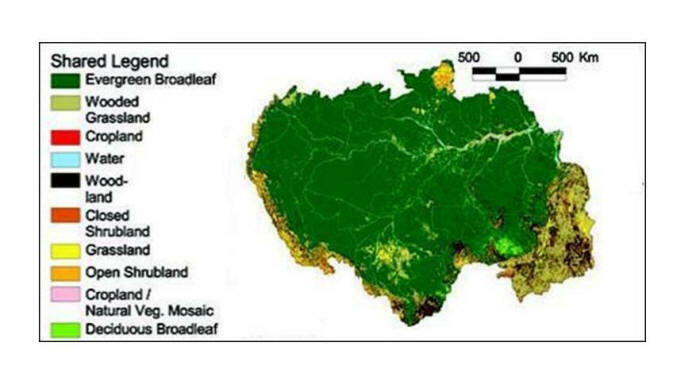 This data set contains 5-minute land use maps for agricultural activity in Amazonia. The data set was produced by the statistical fusion of agricultural census data from Brazil, Columbia, Bolivia, and Peru with the land cover data product from the Global Land Cover Facility. These land use maps indicate the estimated total amount of cropland and pasture (natural and planted) for the Amazon and Tocantins River basins in 1995 and 1980 and are suitable for use in models or other similar purposes. Data are provided in the netCDF format and the ARC/INFO GRID ASCII format. The 1995 data were generated from a fusion of agricultural census data and a satellite classification, and are described in Cardille, Foley, and Costa (2002). The fusion technique merges agricultural census data from Brazil , Columbia, Peru, and Bolivia (Figure 1) with land cover data from the University of Maryland Global Land Cover Facility 1-km classification (Figure 2). This technique was used to derive an estimate of the mid-1990s total agriculture surface for the region, which was then apportioned according to agriculture census data into cultivated area, natural pasture, and planted pasture. The 1980 maps, including only the Brazilian portion of the Amazon/Tocantins river drainage basins (Figure 3), were created by scaling the mid-1990s snapshots backward in time using the relative increase or decrease in agriculture, as derived from mid-1980s census data and United Nations Food and Agriculture Organization (FAO) data (Cardille and Foley, 2003). Figure 1. Major administrative boundaries in the Amazon and Tocantins river drainage basins for 1995 agricultural land cover data. Area includes portions of Brazil, Columbia, Peru, and Bolivia (Cardille, Foley, and Costa, 2002). Figure 2. Global Land Cover Facility land cover classifications for the Amazon and Tocantins basins (Cardille, Foley, and Costa, 2002). Figure 3. 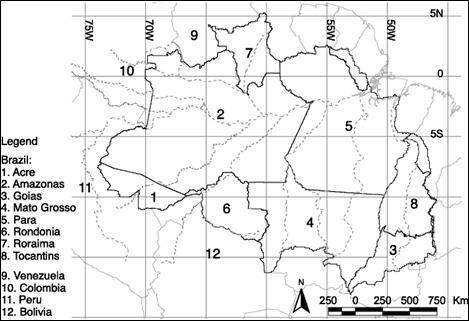 Major administrative boundaries in the Amazon and Tocantins river drainage basins for 1980 agricultural land cover data. Only selected areas within the political borders of Brazil were used for the 1980 study (Cardille and Foley, 2003). This data set was archived in January of 2009. Users who download the data between January 2009 and December 2014 must comply with the LBA Data and Publication Policy. The goal of our NASA funded LBA work is to investigate how the terrestrial ecosystem and water resources of the Amazon basin are impacted by changing environmental conditions and human activity. To achieve this goal, we have been developing new comprehensive regional models and data sets to describe the behavior of terrestrial ecosystems and hydrological resources of the Amazon River Basin. This high-resolution land use / land cover data set is a product of those efforts. The data were generated from a fusion of agricultural census data and a satellite classification, and are described in Cardille, J.A., J.A. Foley, and M.H. Costa (2002). The fusion technique merges agricultural census data from countries of the basin (including Brazil) with land cover data from the University of Maryland Global Land Cover Facility 1-km classification. This technique was used to derive an estimate of the mid-1990s total agriculture surface for the region, which was then apportioned according to agriculture census data into cultivated area, natural pasture, and planted pasture. The 1980 maps were created by scaling the mid-1990s snapshots backward in time using the relative increase or decrease in agriculture, as derived from mid-1980s census data and United Nations Food and Agriculture Organization (FAO) data (Cardille and Foley, 2003). For additional information see the related poster included as a companion file. 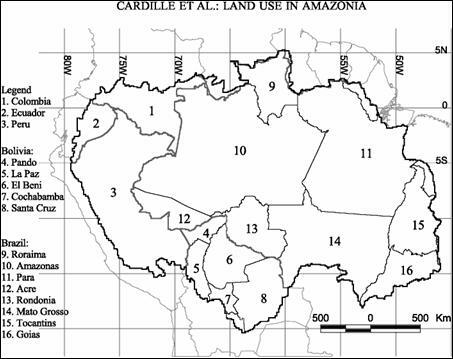 Title: "A New Five-Minute Land Use Data Set for Amazonia Produced from Satellite-Based and Agricultural Census-Based Data "
Sixteen files are included. These include 4 data files for each time period that are provided in 2 formats: netCDF (.nc) files and ARC/INFO GRID ASCII formatted text files (*.txt). These files are gridded at 5-minute latitude by longitude (0.8333333 decimal degrees or ~9km at the equator) resolution for the entire Amazon/Tocantins river drainage basins (21S - 6N; 45W - 80W). The grid contains 420 cloumns (longitude dimension) and 324 rows ( latitude dimension) and is not projected. The files contain the estimated proportions of: total agriculture (totag), cultivated area (cul), natural pasture (pasnat), and planted pasture (paspla) in each grid cell in either the mid-1980s or mid-1990s. The 1980 data covers only the Brazilian portion of the Amazon/Tocantins river drainage basins while the 1995 data also includes areas in Columbia, Peru, and Bolivia. Proportions are expressed as parts per 10,000 so that, for example, a value of 8945 means that 89.45% of the given pixel is estimated by this procedure to be used for agricultural activity. The data set covers the period 1980/01/01 to 1995/12/31. These land use maps indicate the total amount of cropland and pasture for the Amazon and Tocantins River basins in the mid-1990s and is suitable for use in models or other similar purposes. See the related publications for additional applications. These data files are generated by a fusion of two data sources which may contain errors in position and value. In particular, census variables may be susceptible to under- and over-estimation for political, logistical, and economic reasons. While we do not treat these errors of estimation directly, it appears that the fusion technique smoothes extreme/unlikely values in the census data. These data were generated from a fusion of agricultural census data and a satellite classification, and are described fully in the related paper (Cardille, Foley, and Costa, 2002). The fusion technique merges agricultural census data from countries of the basin (including Brazil) with land cover data from the University of Maryland Global Land Cover Facility 1-km classification. This technique was used to derive an estimate of the mid-1990s total agriculture surface for the region, which was then apportioned according to agriculture census data into cultivated area, natural pasture, and planted pasture. The 1980 maps were created by scaling the mid-1990s snapshots backward in time using the relative increase or decrease in agriculture, as derived from mid-1980s census data and United Nations Food and Agriculture Organization (FAO) data (Cardille and Foley, 2003). The 1980 data covers only the Brazilian portion of the Amazon/Tocantins river drainage basins. Cardille, J.A., J.A. Foley, and M.H. Costa. 2002. Characterizing patterns of agricultural land use in Amazonia by merging satellite classifications and census data. Global Biogeochemical Cycles 16(3):Article-1045.